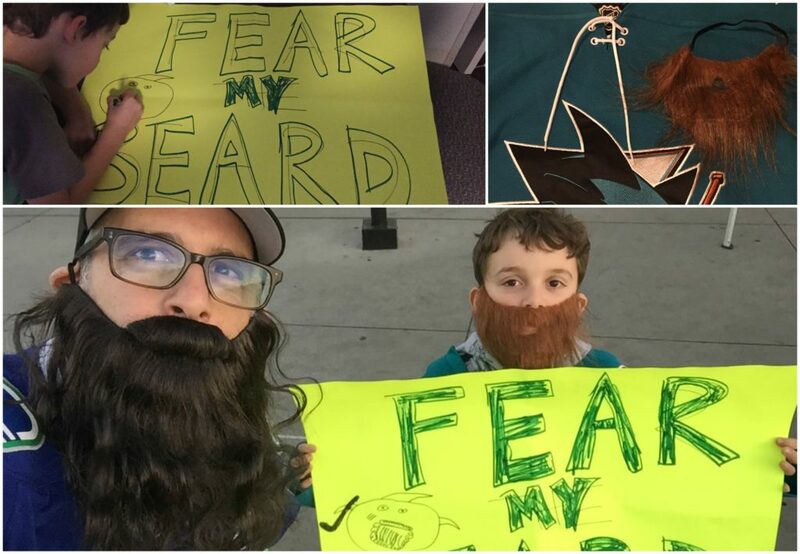 We made a funny sign, put on big fake beards, and showed up 30 minutes before the start of warm-up. 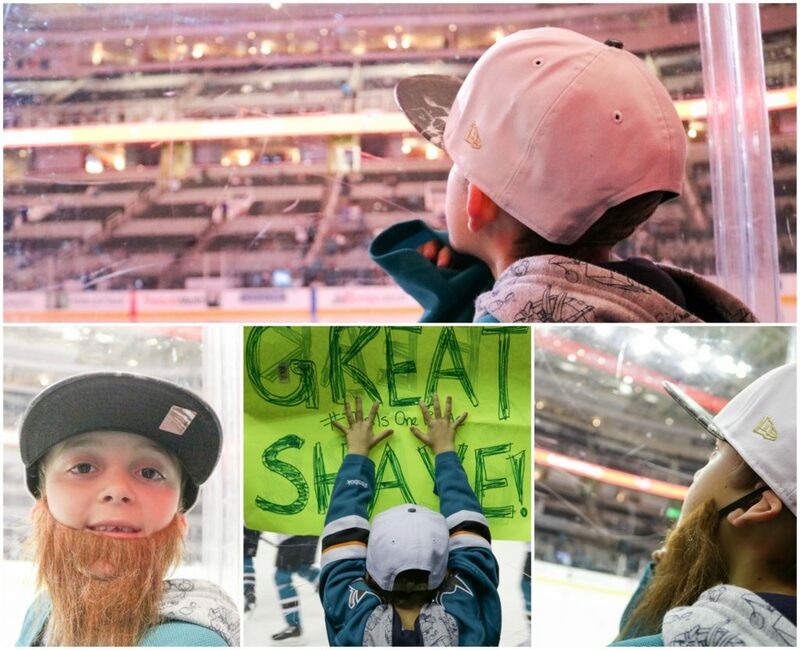 Charlie had on his Sharks jersey, his Sharks hat, and we had positioned ourselves right up against the glass. We did everything right, we were going to catch a puck from a player on his favourite team. 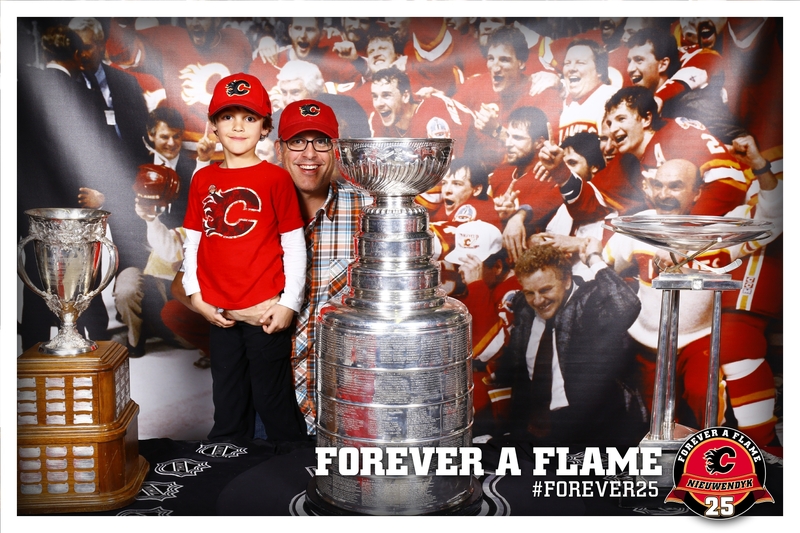 After attending NHL games with my boys in the past few seasons, we learned the routine. 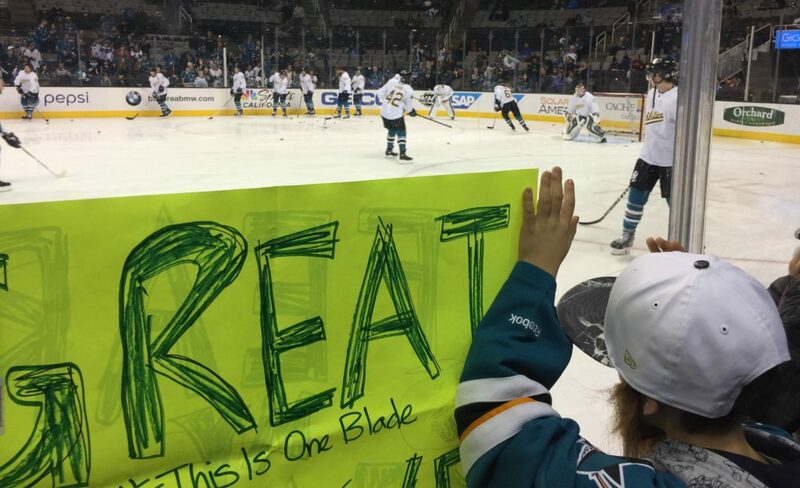 Kids who showed enthusiasm, caught the attention of the players, and looked keen got the reward of a puck flipped over the glass during the pre-game exercises. 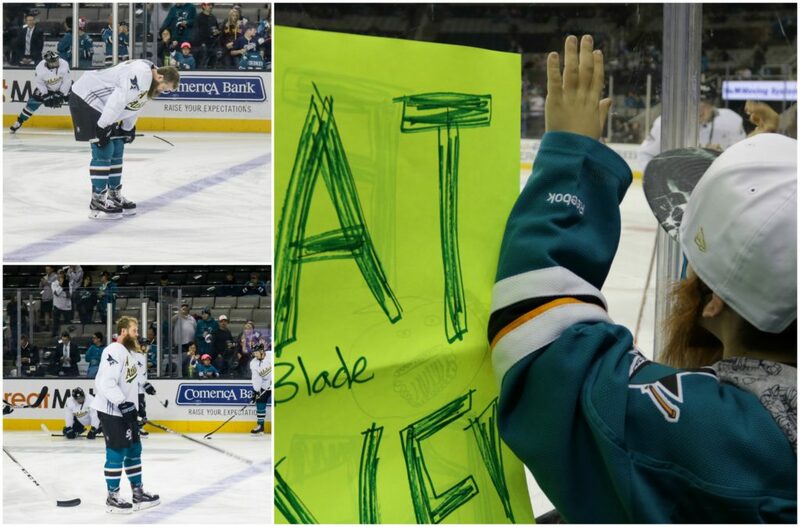 Charlie and I had tried at a Sharks game last year, losing out to a kid with a sign and a big fake beard. 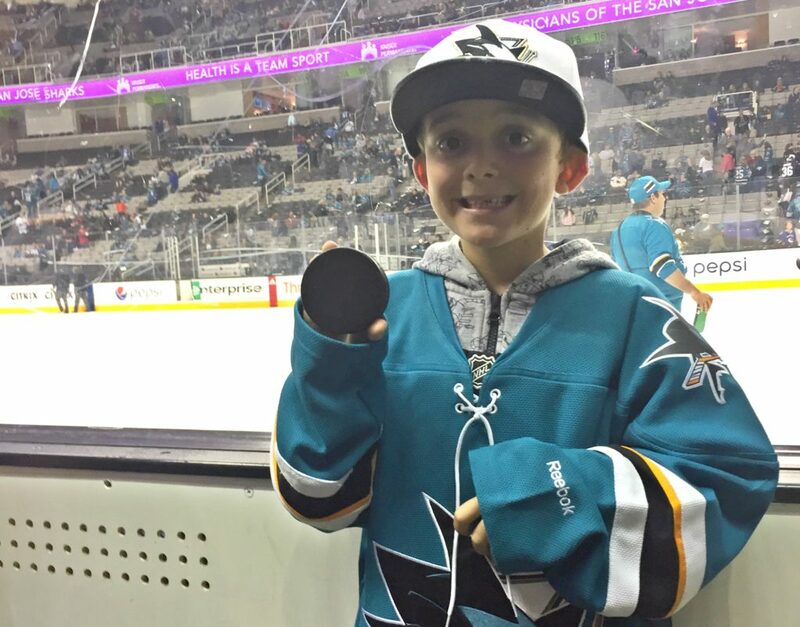 Zacharie, jerseyed up and showing enthusiasm for his favourite Florida Panthers was rewarded with a puck at his game. 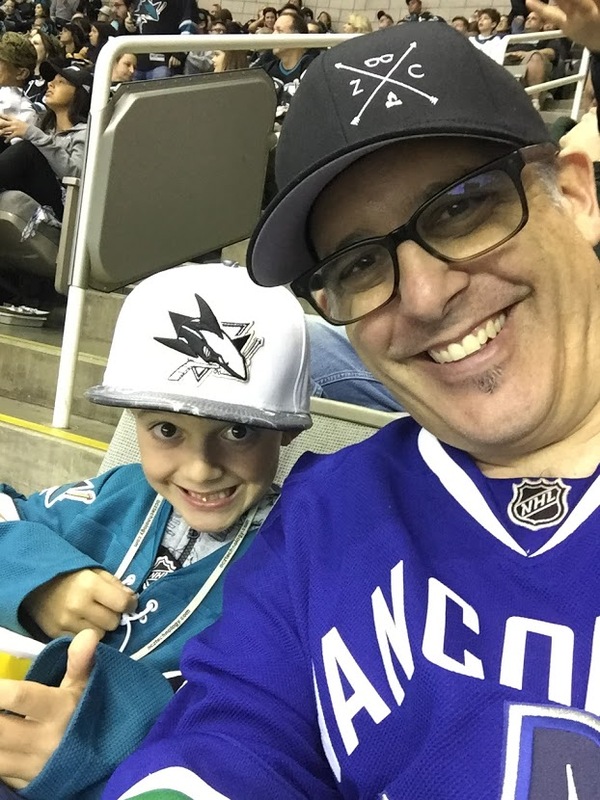 We figured combining signs, costumes, and enthusiasm would work in our favour on our weekend road trip to watch the Sharks play at the SAP Centre in San Jose. Charlie’s sign was great. 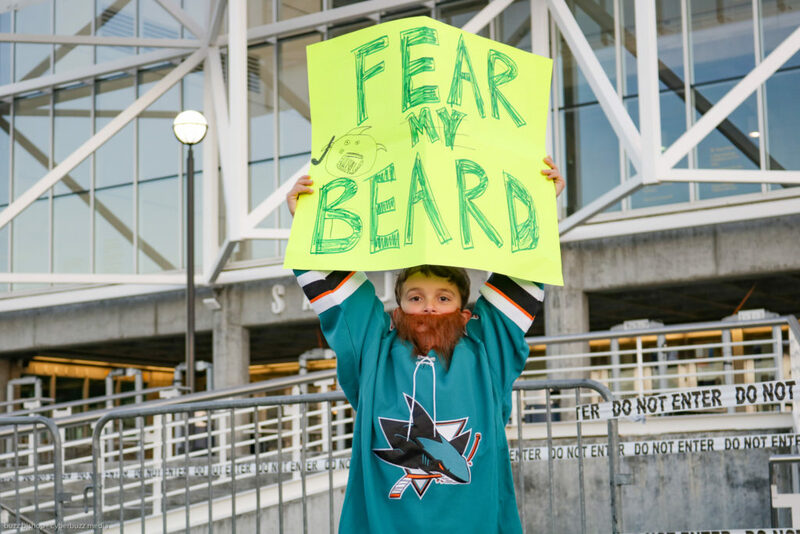 FEAR MY BEARD it blared with a cartoon shark wearing a beard on the side, as he wore a tidy red beard mimicking the fearsome facial hair displayed by Brent Burns and Joe Thornton. 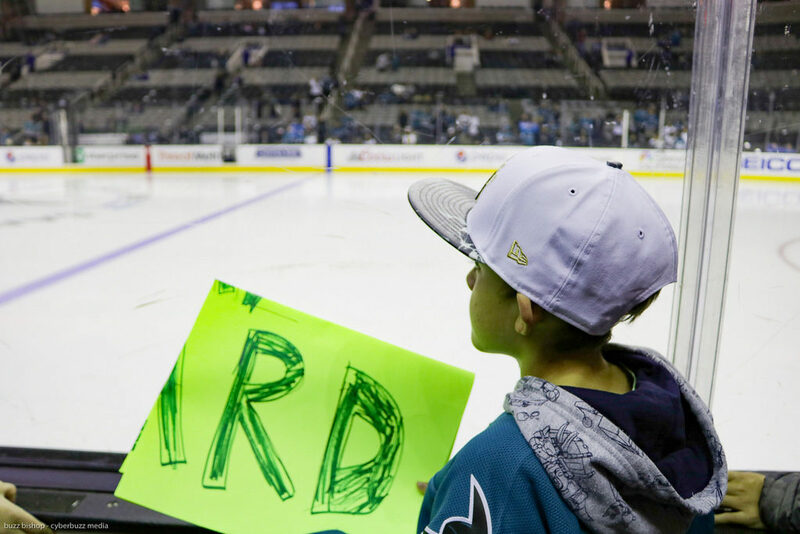 Both winked at his sign as they did their pre-game laps and stretches, but no pucks came. Towards the end of the warmup, a couple of guys played catch with a puck in the air and then flipped it into the crowd. 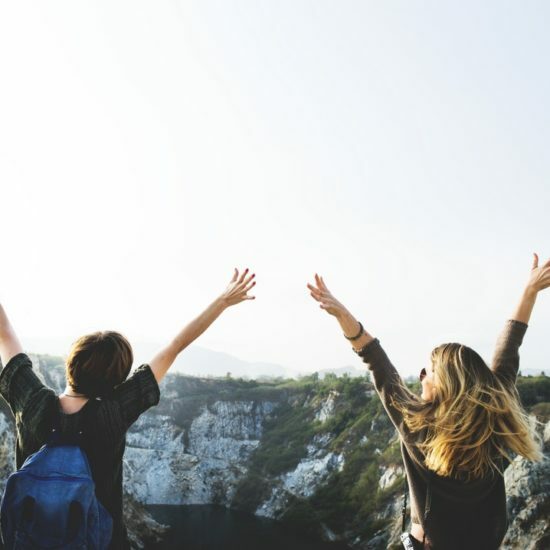 I jumped like I was a center fielder trying to pull down a home run ball in front of the outstretched hands behind me, but I kept coming up empty. Charlie started to pout that all his effort was going to be for naught. Most of the pucks were being flipped about 12 feet to our right, where an aisle came to the glass and the biggest crowds were cheering. We watched about a half dozen fly this direction. When the final puck of the night came over, a guy in his 20s caught it – his second snag of the night. He looked around, like he was going to hand it off, having already caught one. 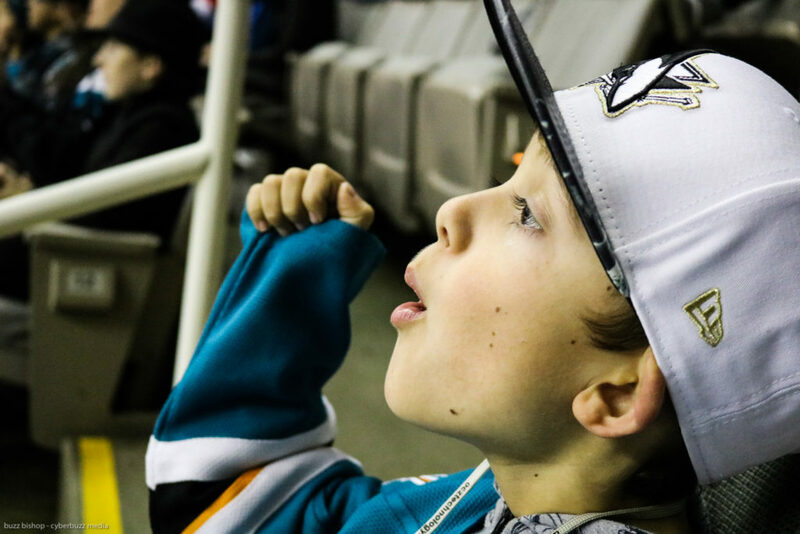 I pointed at Charlie and called over “this kid came all the way from Calgary to cheer for the Sharks tonight! !” And he flipped me the cold, wet, snowy disc. I passed it to Charlie and he beamed. He was so down trodden just seconds ago, disappointed all his efforts hadn’t resulted in a reward and then the guy in the black Sharks jersey with AMERICANO and the number 7 on the back obeyed the golden rule of catching things in stadiums: give it to the kid. It’s these little things that, until you have kids, you have no appreciation for how large they become. Maybe it’s just raising a glove to fist bump in between periods, maybe it’s taking time to sign an autograph or pose for a picture. 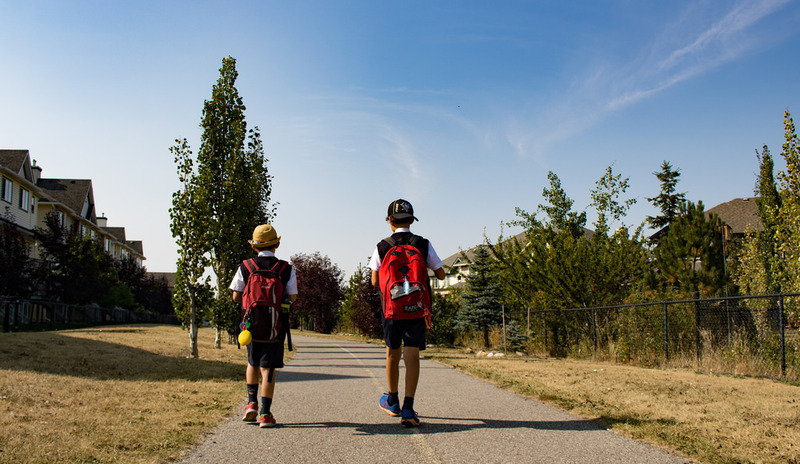 They are but seconds in real time that become frozen forever on the highlight reels of youth. I will never forget that it was Reilly Smith who flipped a puck to Zacharie at that Panthers game, and now I will forever remember the Americano that flipped one to Charlie. 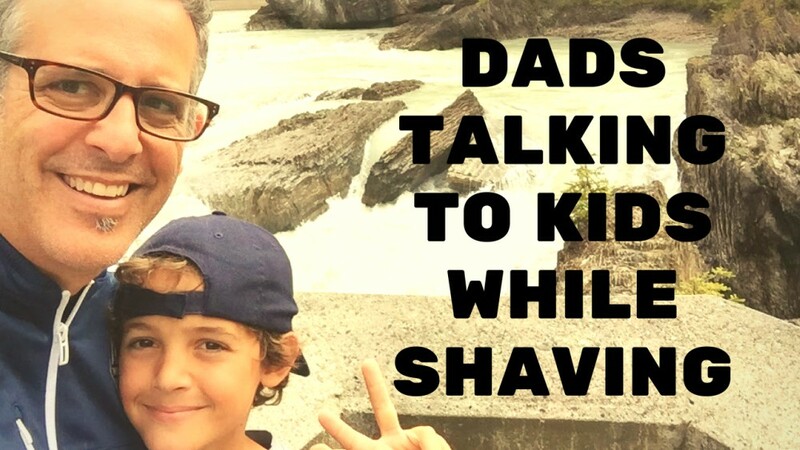 Thanks for giving it to the kid, buddy. 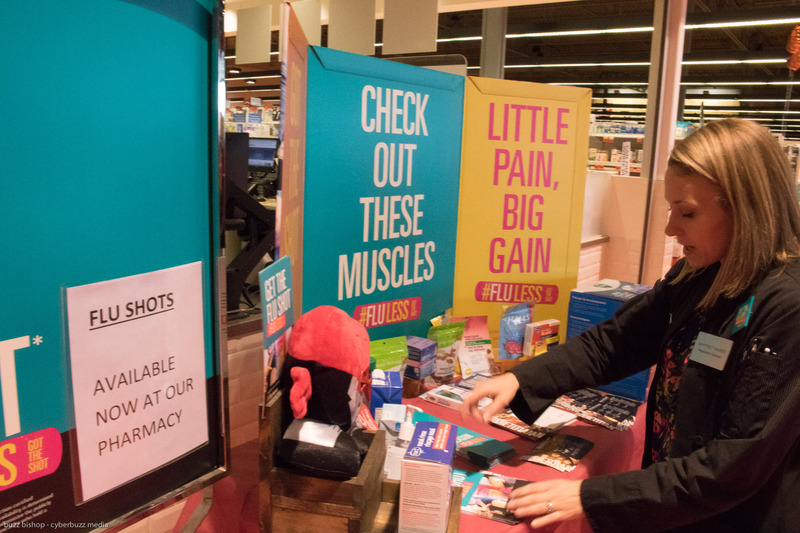 You made our weekend.